If you’re a business owner, you probably know something that most people don’t. You probably provide a service, an idea, or a product in a way that no one else can. This is good. Unfortunately, this knowledge comes with a problem. The more specialized your knowledge becomes, the more difficult it is for you to communicate in laymen’s terms. The end result? Your customers don’t want to listen. Your customers have taken the first option, they do not have the same specialized knowledge that you have developed through your experience. With that in mind, you must take the second option, and transform your ideas. Think of yourself as an elementary school teacher. Pretend you need to explain to a group of students how to multiply 2 by 4. There are two main options: the abstract approach, or the direct. More than likely, as the teacher, the first thing that comes to your mind is the abstract: a multiplication table. This works great for you, but terribly for them. Who wants to pay attention to a multiplication table? Your secondary option is to be direct. Line up 2 rows of candy in 4 columns. Have the child count those candies (and then eat them.) Now they’ll want to know why 2 pieces multiplied by 4 pieces means they eat 8 pieces of candy. You have spoken in the child’s language of candy in order for them to understand your ideas, multiplication tables. Perhaps most importantly, you’ve made them hungry for more. Turn your ideas into candy. Now take your own situation. You have a wealth of information that you could tell a customer, but stop and think about it. How much of this information is really necessary or even helpful for them? 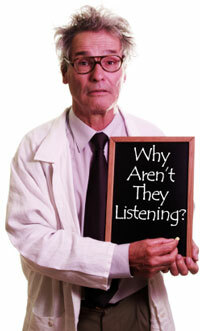 Will your customer want to listen to it? You must distill your ideas into an easy to follow message that a customer will actually understand and be interested in. Your message should tell the customer what you need to tell them in a way that is interesting and fun for them. The idea is to leave them hungry for more. In the next article of our Small Business Marketing 101 series we’ll go into much further detail and walk you through the process of turning your ideas into your customers language. Subscribe to our blog to make sure you don’t miss anything.